Hello Everyone and welcome back to an all new Review Sunday! Just a little heads up, next week Sunday will the the last Sunday that I will be doing reviews. I’ve come to a point where I’ve pretty much covered all of the places I’ve been to when I was in Sydney and haven’t been to restaurants, cafés, and/or eateries around Brunei – well I have, but I haven’t been in a I-need-to-take-a-picture-of-this-so-I-can-review-it-for-later kind of mood lately. Don’t fret! I will still be posting on Sundays, they just won’t be reviews. Instead, I will be sharing with you some of my design works since I believe that the last time I posted anything design related on my blog was about a year ago; so you’ve got that to look forward to! Back on topic, today I will be reviewing one of the best places, in my opinion, to get a fairly priced roll of tender, succulent, crispy-skinned pork crackling. Excuse me for a second while I wipe the drool that just dribbled down my chin as I typed that. Only kidding, but seriously, if you’re ain’t watching your calories, this is where you need to be at every opportunity you get! I’ve passed this place so many times before as it’s within probably a 10-minute walk away from campus, but I’ve never really gone inside and tried their rolls until August of last year I think (and I had been living in Sydney since 2011)! My high school friend (and still friends now) Andrew was visiting from Brunei/UK and I decided to take him here for lunch before his flight back to Melbourne, and then Brunei, eventually to the UK. Of course Jialing was with us too; no food adventure would be complete with my partner in crime. The second time I came here was the Christmas of 2014 I believe, and that was when I saw my friend Marissa post a photo of their special Christmas roll; apple sauce and cranberry relish paired with crispy pork?! Hells yes! Of course I went back with Jialing; she indulged in her Sticky BBQ Pork again. I think I may have gone back a couple times more before I introduced this place to my family when they were over for my graduation in June. Everyone, and of course myself included, loved this place, and how I wish that a Mr. Crackles existed on one of the side streets of Brunei. I’d be their number 1 customer hands down! As mentioned above, I could not resist saying no to this little gem. I think what got me was the apple sauce and cranberry relish; first, you can’t go wrong with crispy pork crackling being paired with some apple sauce. 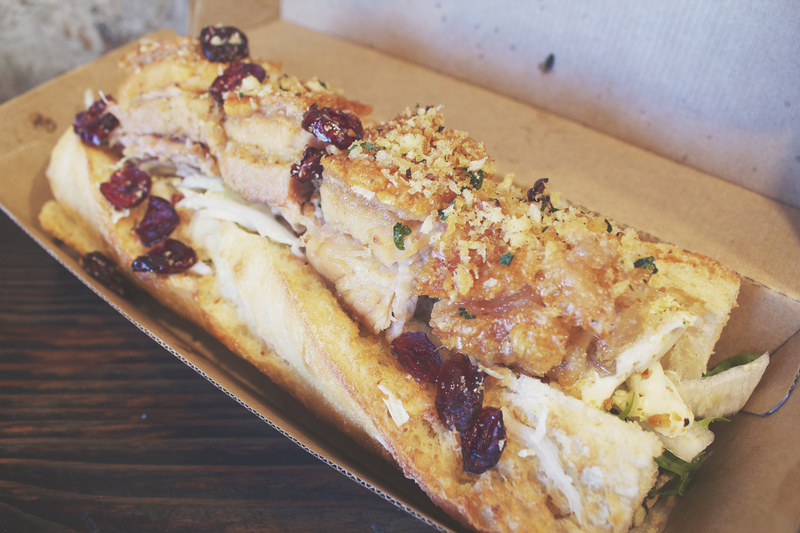 Secondly, the cranberry relish to really pull the idea of Christmas together in this man-sized roll. The pork was, as always, cooked perfectly; tender, juicy meat with a satisfying crispy crackling for that crunch we all look for in a great roast pork. Everything else complimented the roll nicely. 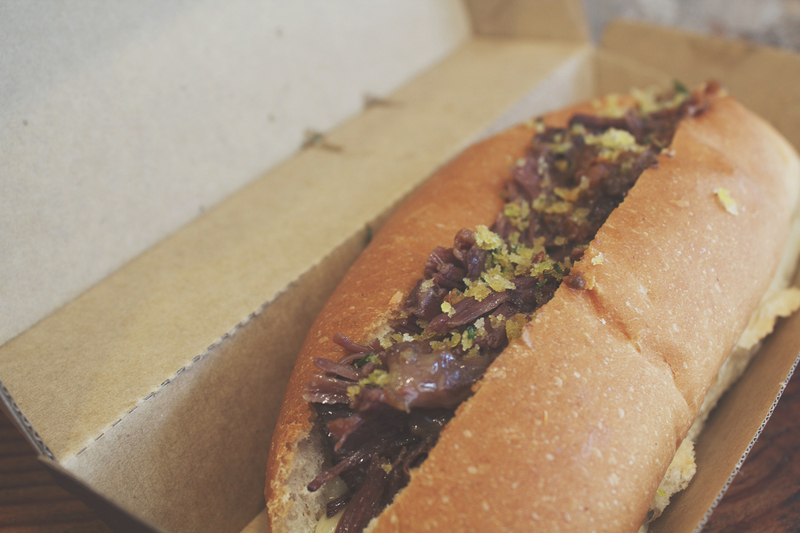 I mean, I know the presentation of this roll is less enticing and extravagant than that of the other rolls, but trust me when I say that this is one pretty amazing combination of tender braised beef cheeks and parmesan mash in a soft bun. I had actually forgotten that there was mash in this bun when I came around to eating it. This was only because the mash isn’t actually visible when you first look at the bun; it was hidden below the braised beef cheeks. When I took a bite and realised that there was in fact parmesan mash in it, it was a nice surprise indeed. If this special ever comes around again, be sure not to miss out on it! I must say that amongst the other rolls, this was by far the best looking one out of the bunch. I mean, I still love and prefer a nice crispy pork on my roll, but this was just something else. 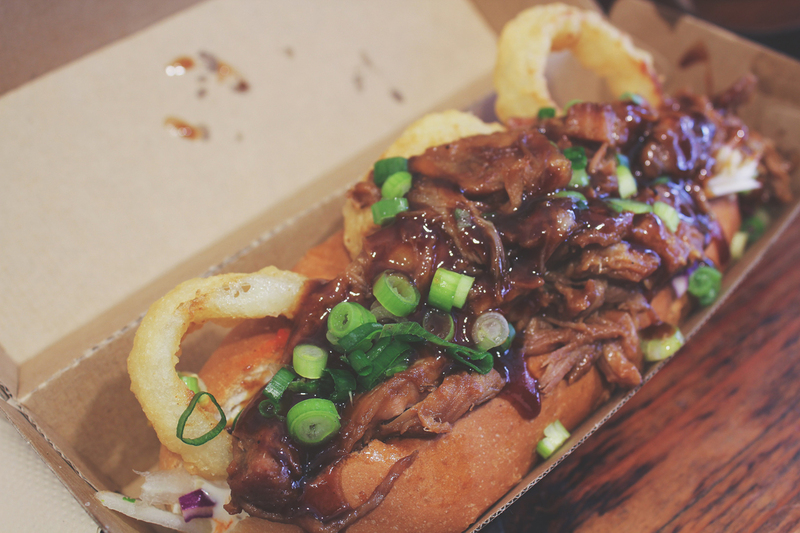 Onion rings in your bun? Don’t mind if I do! Smokey, sticky, check! A bit messy to eat if you’re biting into it instead of being posh and using cutlery, but who cares really. 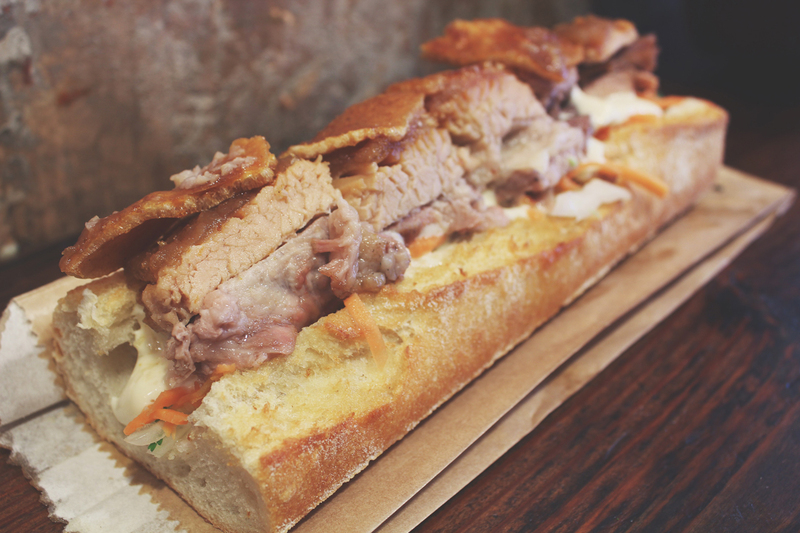 You’ve heard me talk about the crispy pork before in the Crackles Christmas Roll, so it’s basically that, tender, juicy meat with a satisfying crispy crackling, with a nice touch of fresh Vietnamese salad to compliment the meat. Its like their Crackles Classic Roll only twice as much meat on it for a man-sized bite, but who says women can’t have it too? This would’ve been flawless for me if it weren’t for the tomato sauce(?) in the nachos. I can’t quite put my finger on what it tasted like to me, but all I know was that it was a bit strong and acidic for my liking. I had to pick out the fries that were least covered in the sauce as I did not want it to go to such a shameful waste. In the end, I ended up leaving about a third of the fries behind, but still eating all of the yummy crispy pork of course! 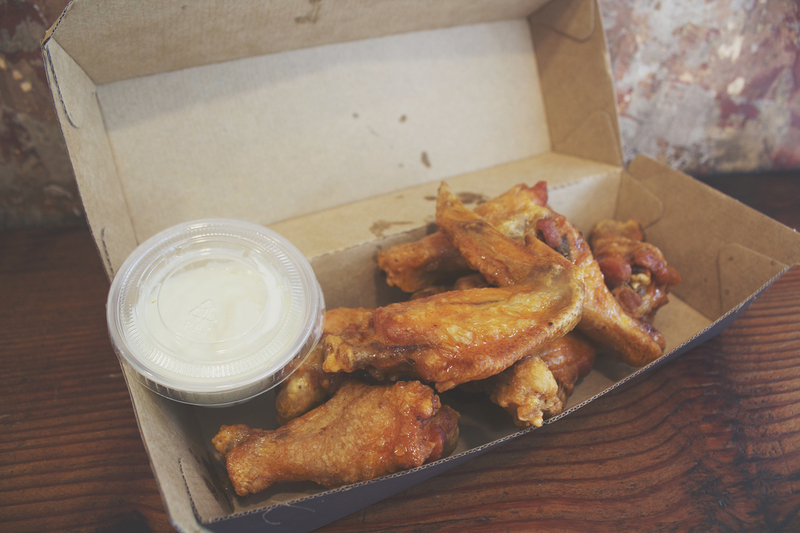 The chicken packed just the right amount of heat in them and let’s be real here, you can’t possibly go wrong with buffalo wings AND blue cheese dip! These were delicious indeed. When I first saw these cups of magical cracklings, I knew I needed to devour one. To be honest, I was a bit disappointed with them as they weren’t quite what I had imagined them to be. They were a bit too salty for my liking, hard, and dry. I prefer the crackling on top of those pieces of meat on their rolls than this crackling. 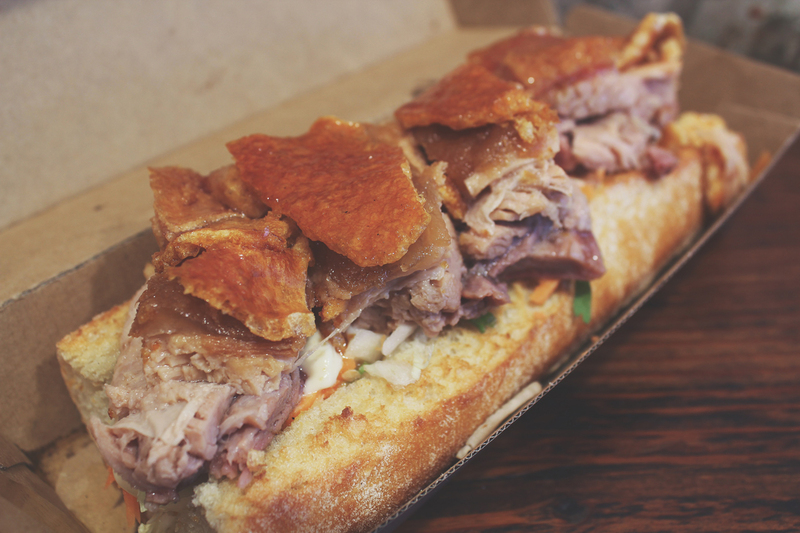 Mr. Crackles is like a Western take on a classic Vietnamese pork roll. 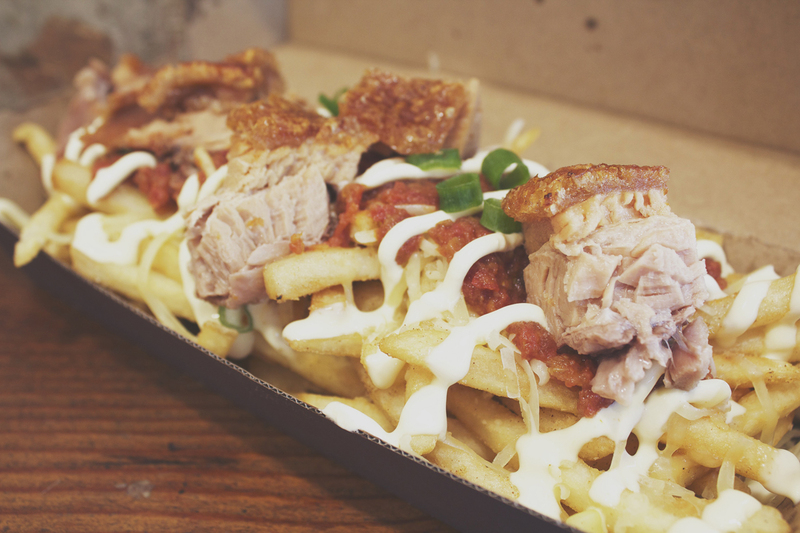 Overall, if you want your daily fix of crispy pork crackling, be it in a roll, salad, or topped with your nacho fries, then Mr. Crackles is the place for you. I’d say that their rolls are reasonable priced for the size you get, therefore I’d give value for money an 8/10. 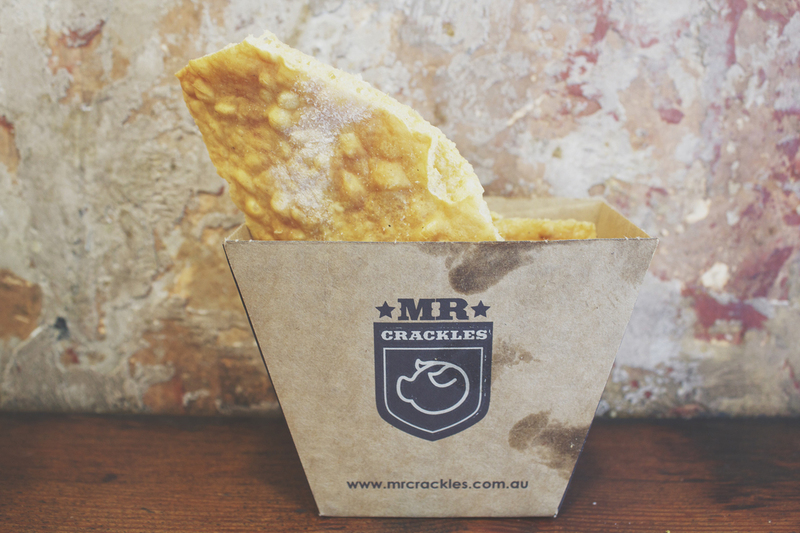 For those who haven’t been to Mr. Crackles on Oxford Street just somewhat opposite Taylor Square, you’ll notice that they have very limited seating – 8 seats to be exact. Every time I go there though, I still manage to snag a seat and that’s only because everyone that goes there gets their rolls to go. I guess I can’t really judge the ambience of the place seeing as it’s more of a place where you’d grab your food and eat elsewhere, but if you do end up sitting down at the place to have your food, it’s quite loud from all the traffic noise on Oxford Street. It can also get a wee bit crowded if you go during peak hour, which is usually lunch and dinner I’m guessing. I saw crowded because you’ve got a lot of people lining up and waiting around for their order. If I were to give the place a rating, I’d say 7/10 as it’s alright as a takeaway place, but I’d give it a 4/10 for a sit down place. Besides that, I’m pretty sure you all know that I’m definitely going to give the food a sure 10 for the rolls. The sides had some minor issues with me, but nothing too big that would make me take it out on the rest of the menu. You can’t fault a perfectly great roast pork like that from Mr. Crackles! If you can, than you are not my friend. I just love the food ! My favorite is the Bogan.